I wanted to learn more about the wine and where it came from, but I didn’t want anything I read to influence my taste so I drank and made notes first. Just from appearances, it had a rich yellow color like a Chardonnay and heavy legs on the glass. However, it didn’t have any oaky taste that I was expecting from the Chard-esque appearance. It had some stone fruit tastes to it, like peaches or apricots, and then it had almost a mineral after taste. It was truly unique from any other white I’ve had and I found myself savoring it, trying to detect different flavors in each sip. Look at me, drinking French wine and turning into a wine snob. Quick, someone get me a box of the Franz to keep me grounded. On to some wine nerdery, since I did some research. (Feel free to skip on down to the Tasting Notes if this isn’t your thing.) As I mentioned, Old World (Europe) wines are named for where they are from, not the actual grape variety. (For example, champagne is not a grape, it’s a region in France… champagne can only be called champagne if it comes from that region!) I know for more well-versed winos this is an obvious statement, but it was one I can remember being surprised about when I first started trying to better educate myself as a Grocery Store Wino. 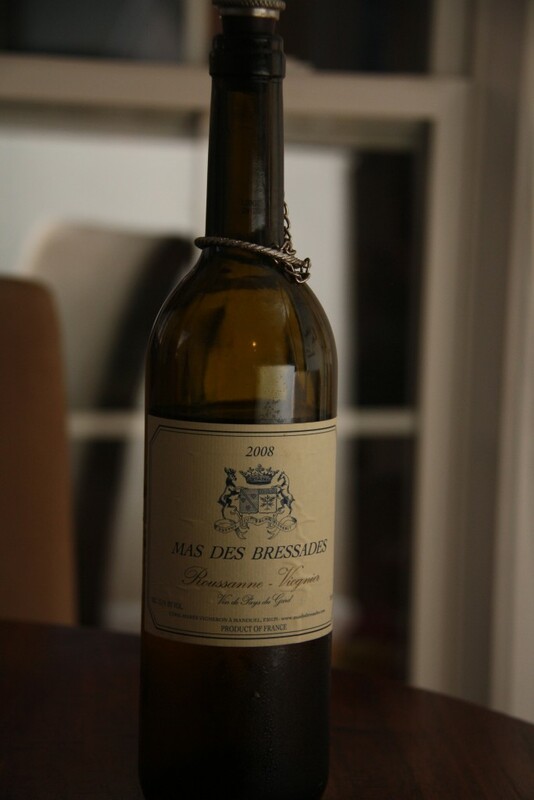 So, Mas des Bressades is the location in France – the actual name of the estate – where these grapes were grown. It is located in the region of the Rhone river, a very prominent wine region. Since I’m already sounding like a 4th grade book report, let me go ahead and just throw this out there: appellation is the word used to designate different wine growing regions. That will be on the final exam, kids. The two grapes in this white blend are Rousanne and Viognier. Rousanne, I learned, is a white grape that has a reddish hue as it ripes. It’s been likened to herbal tea, which I think is what gave this wine such a complexity to it and why it didn’t taste quite like the Viogniers I’ve had before. Anyways, if you’ve read this far, it means perhaps you’re feeling as nerdy about wine as I am. I’m not sure if this is an easy to find wine, as I know my friend bought it in a wine store and not a grocery store, but if you come across it – grab a bottle and give it a try! And once you’re a few glasses deep, let’s discuss the finer points of appellations and terroirs, shall we? Delicious wine and spot on description, Meg. Great example of an Old World wine that drinks like it’s New World. The vintage shows 2008. While the memory of this wine is fresh, you should try the most recent vintage (probably 2012). Both wines are wonderful, but for different reasons. It would be fun to see what you think. Thanks for the suggestion! I will look for the 2012 to try. Thanks for stopping by, John.